No monologue is necessary, sing 16 bars of a song of your choice. 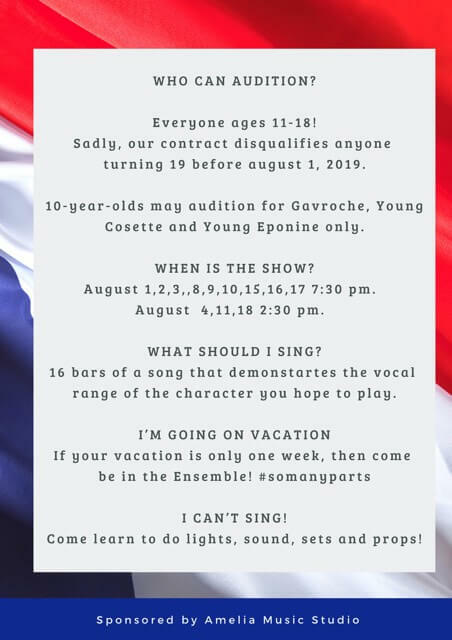 Student Musicans Can Also Audition: Orchestration for this show includes: Bass, cello, horn 1 & 2, keyboards, flute, piccolo, oboe, Bb clarinet, bass clarinet, Eb clarinet, trombone, trumpet 1&2, viola & violin. Students auditioning for the pit need to play 1 minute of a solo, unaccompanied.